I love Bjork and I love faces and I love drawing.... so why not draw Bjork faces? Or any faces with lots of expressions. How lucky are we that when we need a certain image, say a face, with a certain expression, all we have to do is look online and there we will find way more than we asked for. On Pinterest you can find so many faces with different expressions for reference. 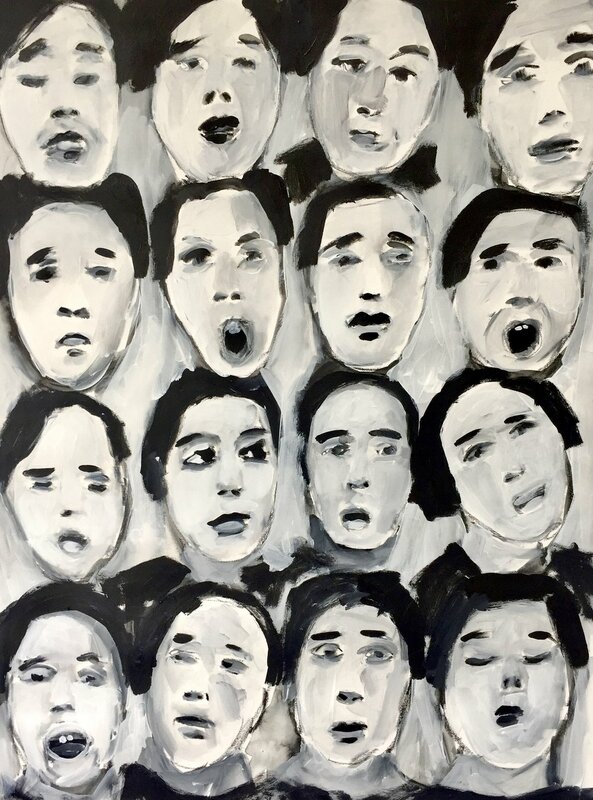 Find a set you love (or take multiple self-portraits of yourself making different faces) and use it to draw, then paint, multiple faces on one sheet of paper. Much like the drawing of 100 faces, but this time focusing on expression and then painting each. I used a Stabilo pencil to loosely sketch each face out. I then used gesso, titanium white, and carbon black to paint the faces. I found this to be a really fun exercise, hope you do, too! You can combine this one with other exercises, like using two colors or painting with the primary colors or keep it simple and just use black and white.